Some people may find it pretty useful to have all information about a MP3 song available. The advantage of this is that it gives you the ability to organize music in various categories, from genre to name. And of course, it’s nice to know who the artist is, what the song is called, and how the album is called. 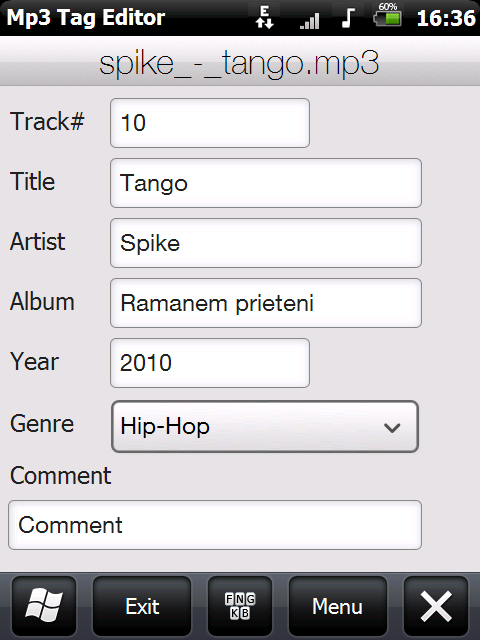 Now, all these options can be configured with a new application for Windows Mobile, called MP3 Tag editor. Based on eboelzner’s Sense Interface SDK, this application, made by XDA developer virgilp, allows for easy navigation and a touch friendly HTC Sense-like user interface. As the name pretty much says it, this is an tag editor for mp3 files so they can be nicely displayed in the media player. For now, only ID3v1 tags are supported. MP3 Tag Editor supports Windows Mobile devices with VGA and WVGA resolutions, and you’ll need to have .NET Framework 3.5 installed in order to get it working. For now, it only supports the ID3v1 tag. This tag will be permanently deleted when editing it, so make sure you know what you’re doing. You can find more information, downloads, and leave feedback on the application thread.